aint Breward sits upon the history strewn shoulder of the ancient moor near Bodmin in North Cornwall, nestling amongst staggering scenery which is both desolate and wonderful bound together as one. St Breward's legacy is at her very heart. The mighty granite. Great stones which remember the Bronze age men who toiled and stacked the moorland field stone and bear witness to the beginning of an incredible industry which was to change the face of a nation. St Breward's finest men methodically hewed the giant stone slabs and dragged them to the cutting sheds before hauling them to the rail head. Fortunes were to be won an lost here in St Breward as the crash of hammer on steel was carried on the wind. Over the centuries there have been over 25 different quarries in the area around St Breward. But only the De Lank Quarry still remains. The others, from which the village, its parish church and countless architectural treasures emerged, now lie derelict and forboding, slowly returning back to nature. They are now a still and silent testament to the industry which supported the area and built a nation. Less grand perhaps but more naturally beautiful are these stunning images showing local examples of St Breward hewn architecture assembled here by St Breward's award winning photographer Jackie Freeman. 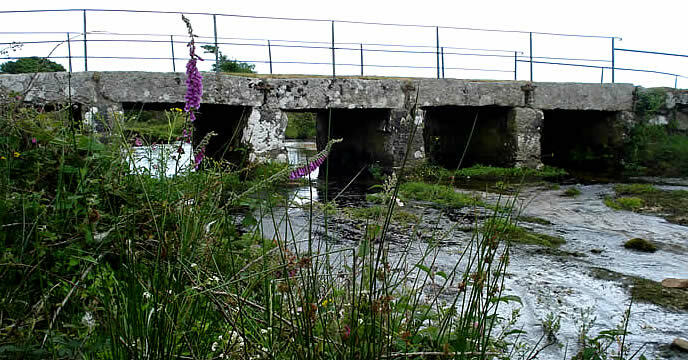 Gam bridge spans both the Allen and Camel rivers at St Breward and was first built and named in 1613. The term Gam comes from the Cornish word 'bent' or twisted and is the derivation of the commonly used slang 'gammy leg' referring to the twisted limb of a person with rickets. In the great flood of 16th July 1847, which was caused by a freak waterspout which appeared on Davidstow Moor, the bridge was completely swept away along with all the other bridges on the Camel with the exception of Helland bridge and Wadebridge. This fact is not surprising as the horrendous tide of water which swept down the Camel valley from the moor out stripped the recent Boscastle flood in August 2004 with a wave nearing 20 feet high. 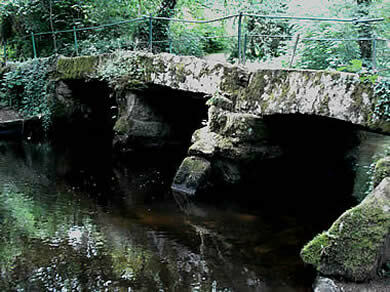 The bridge was subsequently rebuilt out of local St Breward granite. Today t is a listed building of significant national interest which is why there is a weight limit imposed to the traffic it can carry. It is listed as; 7 span bridge with unmoulded granite lintels and crude cutwaters. Stone rubble parapet with unmoulded granite coping. near St Breward and is a huge Cornish granite clapper bridge made of St Breward quarried granite. formed by using huge altar like slabs of granite supported on stone pillars. 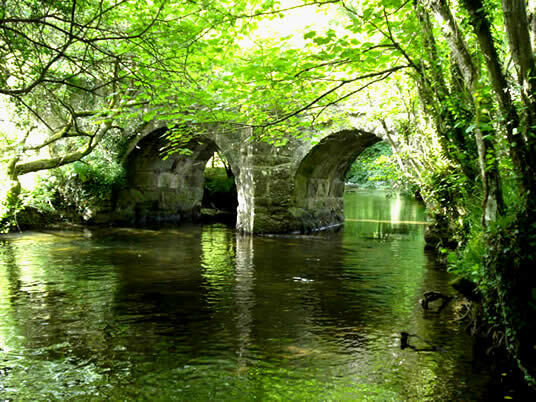 One of the finest examples of clapper bridges to be found in Cornwall is here, over the De Lank river near St Breward. A listed building built of St Breward granite. A 3 span road bridge with granite rubble piers and monolithic granite spans. One of 2 clapper bridges over the De Lank river here. estiges of North Cornwall's past abound here in and around the village of St Breward in Cornwall, but it was not only the granite which the earth gave up as its prize. 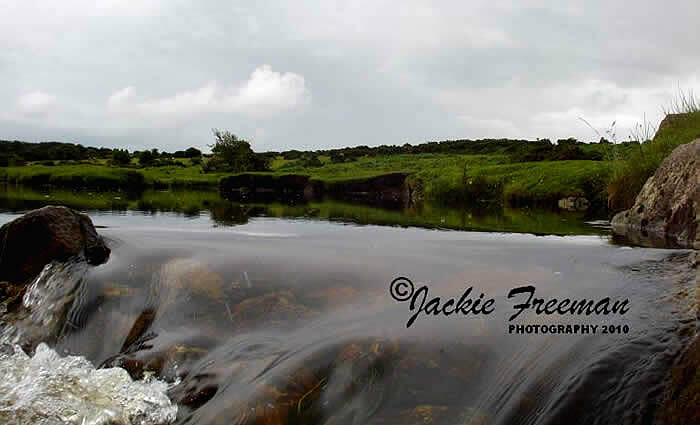 Photograph of the De Lank river, St Breward in Cornwall Tin streaming workings along the banks. 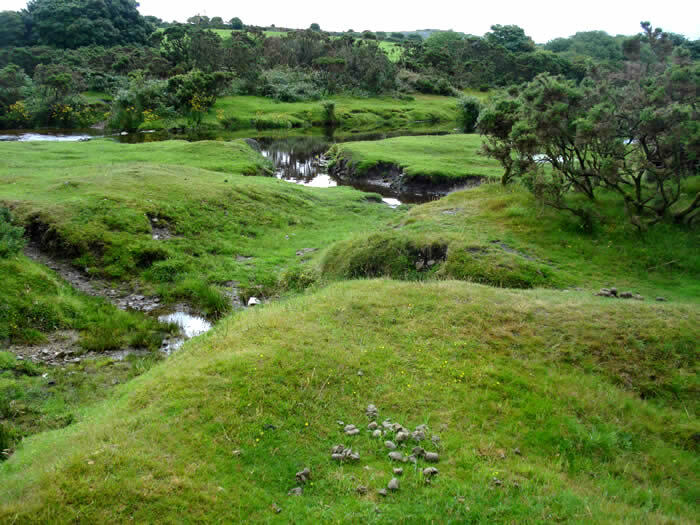 Tin has been streamed here in the area around St Breward for centuries and the land around Bodmin moor held more precious materials which St Breward's entrepreneurs sought in both ancient and modern times. Prehistoric prospectors worked here as did St Brewardians throughout the Middle ages in the search for tin. It is firmly believed that the Roman Garrison stationed at Nanstallon only eight miles distant from St Breward were installed there in the 1st century AD to supervise the tin works which were in operation in the area. This is more than likely connected to the issue of taxes to be applied to the product rather than to collecting the product itself! Though mining tin was favoured in those times, tin streaming became an ever more popular way of obtaining the ore and was a common preoccupation in St Breward. Tin streaming is relatively simple operation and is accomplished by sieving silt and sand from the bottom of stream beds either by hand or mechanically using sluices and channels similar in effect to panning for gold. By washing away the silt, any deposits of tin or can be extracted and collected ready to be crushed and smelted. 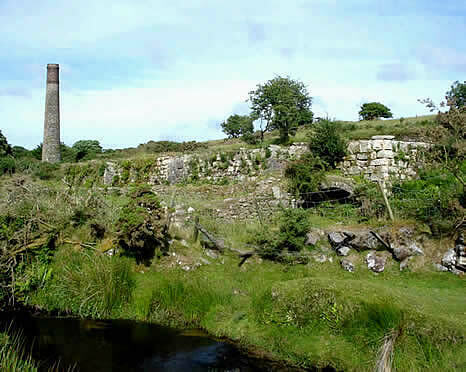 The De Lank, Allen, Camel and other steams emanating from Bodmin Moor were all plundered for their tin content, with the local tin industry seen in the Middle ages as being second only to sheep farming and wool in particular as the main regional income earner. By the 1300's, Bodmin coinage, the name given to the process of assaying, weighing, testing and stamping of the pure tin collected here, was in effect and had been from early times through a charter granted to the town by King Richard I which allowed for the sheriff of Bodmin to literally coin his own money. From as early as the year 1200, French merchants were travelling to Bodmin to buy tin in great quantities from Bodmin market. With he Bodmin tinners producing more than 3 times more tin than any other area in Cornwall at the time, this shows the importance of the area and how tin contributed to St Breward's economy at the time. Silver too, though in very in small quantities would be found here and serious attempts to extract copper were made in the 1800's to the north of St Breward's Church at Churchtown. In those days, the Mitchell family who lived at Hengar Manor, owned much of the land here around St Breward and they began operations back in 1845 by setting up a very grand sounding company called the Great Mitchell Consols. 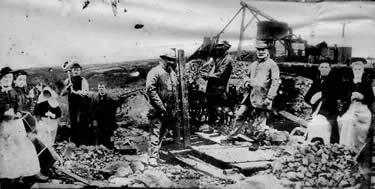 They began by sinking shafts deep into Mine hill which would become a hive of activity with all the trappings of a commercial mining enterprise in its day. But the locals hard work, cutting deep into the hill by hand and working in dreadfully cramped and dangerous conditions would be short lived. The mine was abandoned in 1848 having produced only minimal amounts of copper ore which made the Mitchell's just £500 by return for all their investment and efforts. Firmly held local belief, be it myth or by wishful thinking, was that St Breward's hill was yet to give up its mother load of Mundic and Copper & Fluorite too, a rarely found mineral held in high regard for its ornamental properties by Victorians who were keen to have Grottos in their gardens. 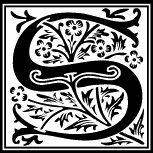 So a new company, this time the Great Onslow Consols was founded, followed close on its heels by the even more splendid sounding St Breward Consols Great Copper Mining Company but it too, fizzled out after a few years of toil and tribulation and with little practical success. Other than from the Arsenic which was found here in minor quantities an sold on. All that is left behind here on St Breward' s picturesque hillside today are the old adits, capped off mine shafts and gorse covered depressions where once the settling tanks stood and a rather dishevelled heritage stone telling the story of how St Breward so nearly struck it rich. Had Mitchell and Onslow's mine been successful, then today little would be left of this beautiful part of Cornwall and St Breward would be an industrial nightmare. Mine Hill excavations. St Breward, Cornwall. C1900 Mine Hill excavations St Breward, Cornwall today. Looking west over Mine Hill at St Breward in Cornwall. 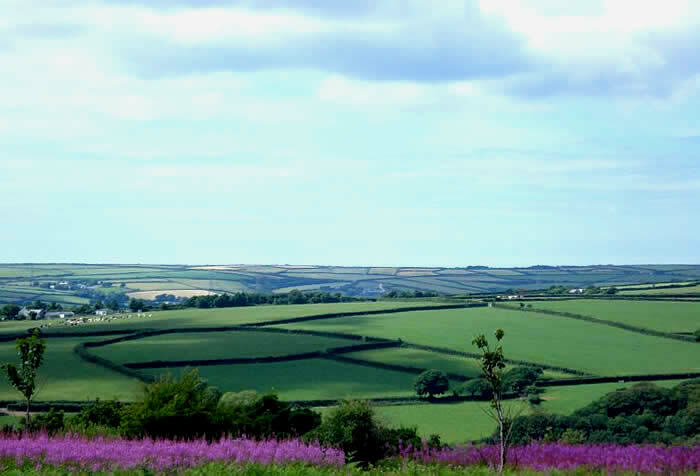 China clay extraction has already been mentioned previously as having contributed to St Breward's more recent cultural and industrial past, with clay fields found to the north of the village at Stannon Downs begun & exploited just over a century ago. The operation here was and is huge. So was the market for the stuff back then and as such it wasn't surprising that great clay dries, huge buildings which contained under floor heating powered by giant furnaces were built. The one shown on the left is all that remains of the closest dry to Stannon. But the largest, Wenford Dries, built by the rail head at Wenford Bridge still stands today and has some remarkable local claims to fame. Some St Breward folk consider it to be the biggest single block structure in the world. That claim aside, Wenford dries is a bit of an eye sore these days, surrounded by barbed wire and a nightmare of asbestos and rubble. Little investigated by the holiday makers & nature lovers frequenting the Camel cycle trail which starts just over the road from it. Interestingly, English Heritage have the Wenford Dries listed as a building of special architectural importance, which undoubtedly will serve to make extremely difficult any attempt at redevelopment or alteration for the good of the area. Wenford Bridge over the Camel River St Breward, Cornwall. Mine Hill excavations St Breward, Cornwall today. Looking west over Mine Hill St Breward, Cornwall. Bridge, bridges, Cornwall, river Camel, granite bridge, granite bridges, Clapper bridge, Clapper bridges, Cornish clapper bridge, Cornish clapper bridges, River Camel, river Camel bridges, history, bridge building in Cornwall, granite, clapper, Wenford bridge, Gam bridge, Delford Bridge, Coombe Bridge, Delfy bridge, Bradford bridge. Cornish, Wenford, Delfy, Coombe, Bradford, Wenford Dries, De Lank, De Lank River, De Lank river bridges, De Lank river bridge, tin streaming in Cornwall, tin streaming, bridges over the river Camel, Camel valley, St Breward, Bodmin moor, Bodmin moor bridges, Bodmin Moor clapper Bridges. 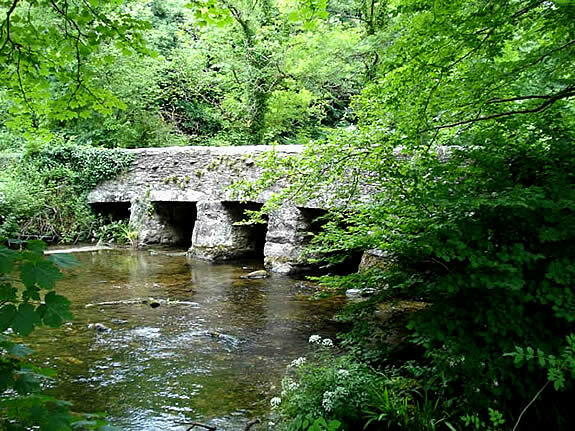 St Breward bridges, river Allen, river, Coombe Millhouse. St Breward, Mine Hill, China clay, Stannon Downs, Stannon, excavations, clapper bridges, Davidstow Moor, Helland bridge, cutwaters, parapet, granite coping, tin, quarries, silver, copper, Hengar Manor, Mitchell family, Fluorite, Jackie Freeman, David Freeman, Jackie Freeman photography, images, photos, photographs.